Whether wrapping, shipping, or storing professional photos (Up to 6" x 8"), a small present, holiday or birthday sentiment, or keeping snack food & goodies fresh, our pack of 200 bulk cello bags are the answer! Just one, resealable bag completely covers items from dust, scratches, sticky finger prints, and more. Our product takes up minimal storage space, so you'll always have a bag handy when life comes calling. We offer a large selection of industrial strength, transparent crystal clear sleeves and envelopes at an affordable price! Our heavy duty display, storage & mailing bags are made using professional grade clear cellophane - similar to polypropylene AKA: poly bags - with a pre-gummed adhesive, fold over flap seal that allows the length to be adjusted to create the perfect fit. See through plastic bags are available in a variety of sizes to accommodate all your gifting, bagging, and mailing needs. This packaging is resealable and is approved for mailing by the US Post office. ...If you're ready to cover, protect, and store small and medium sized photos, gifts, paper note cards, and more... then ORDER NOW! 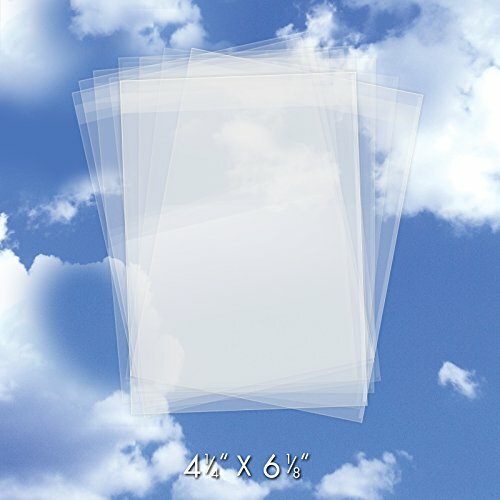 200 CLEAR CELLO SLEEVES - Thin & durable resealable sleeves to wrap & protect a multitude of items. This 1.6 Mil protector lies flat and takes up minimal storage space. Depending on the thickness of your item, you may want to allow for 1/4" of space around it, to ensure there's adequate room to seal the bag. MULTI USE PLASTIC BAGS - Measuring 4.25 x 6.125 inches, these hefty & thick - 1.6 Mil thickness - cellophane packages have multiple uses you'll enjoy. Whether it's storing up to 6" x 8" family wedding photos, protecting Christmas & birthday note cards, or sealing a snack food, these multi-use package protectors are easy to seal mailers for your home, kitchen, business office, or retail shops. APPROVED USPS MAILER - Instantly ship a greeting card, note card, or gift via USPS mail! Each packaging bag forms to the size & shape of your notecards, gifts, treats, or supplies. They're extra durable & thick for premium protection. RESEALABLE FLAP - If looking for a sleeve that quickly seals shut & opens with ease, then look no further than our cello envelopes with a self adhesive flap! This allows you to adjust the length around your item to create the perfect, snug fit. We also offer larger protective, gusset style cello sleeves to store goodies & treats like: gourmet chocolates, nuts, popcorn, cookies, or pretzels! ABOUT US - Founded in 1980, NobleWorks - and The Best Card Company, its non humor division - is an award winning brand and an American based, family owned office supply company & stationery publisher. We have cause for celebration as a proud board member of the Greeting Card Association. Our team strives for 100% perfection and customer satisfaction for every sealable cello & poly bag, greeting card, appreciation gift card, or humorous note cards with envelope. If you have any questions about this product by The Best Envelope Company, contact us by completing and submitting the form below. If you are looking for a specif part number, please include it with your message.